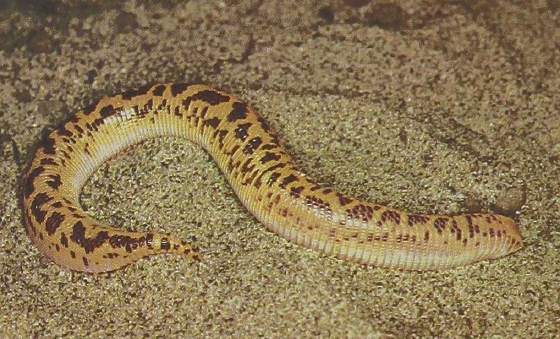 The Somali Edge-snouted Amphisbaenian is one of some half-dozen members of a family (Trogonophidae) placed together because their teeth are fused as bumps on the edge of the bony jaw rather than in sockets against the jaw’s edge. These species occupy the deserts from Morocco to Tunisia and from Iran across Saudi Arabia to Socotra Island and Somalia. They have become specialized for tunneling in sand by an oscillating movement in which the body alternately rotates left and right. The Somali species has a triangular rather than circular cross-section of the body, a shortening of the trunk, and a downward curved, pointed tail. All of these features keep the trunk stable when the animal moves. The beautiful and protective blotched coloration is similar to that of the surface sand of the deserts they inhabit. 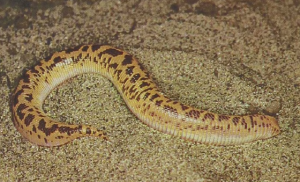 An example is given by this species from Somalia which is about 4 inches long.